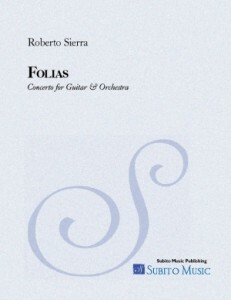 Celebrated guitarist Joanne Castellani introduces Sierra’s concerto Folias, which will be featured on June 9th at the Buffalo Philharmonic’s final concert of the 2012 JoAnn Falletta International Guitar Concerto Competition. Castellani — along with festival co-artistic director Michael Andriaccio (of The Castellani Andriaccio Duo) — have long been associated with Sierra’s music. Sierra composed two works for the ensemble: Of Discoveries (Concerto for Two Guitars and Orchestra), and Fantasia Corelliano (for Two Guitars and Strings) which they subsequently recorded on an award-winning disc. 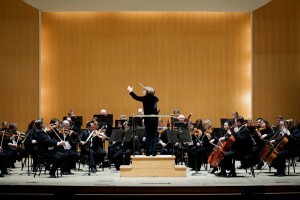 The concert takes place at the Buffalo Philharmonic’s Kleinhans Music Hall and will showcase Falletta conducting three finalists playing to a live audience. For more concert details and ticket information, click here. Also happening this month is the Chameleon Arts Ensemble’s performance of Tres Pensamentos on June 2 in Hyde Park, MA. Upcoming Sierra events: In July, the New Juilliard Ensemble (NYC) — led by Joel Sachs — presents Concierto de Camara on the 8th at the MoMA Summergarden New Music Series; and on the 27th and 28th, Marcus Bosch conducts the Nuremburg State Philharmonic concerts of Fandangos at the Scholl Hellenstein Festival. Back in April, Fandangos was featured at the Nashville Symphony led by music director Giancarlo Guerrero, and subsequently recorded for future release on Naxos. Next season, Guerrero takes Fandangos on the road when he guest-conducts the work at the Boston Symphony in November.